Please Note: That the below testimonies were written by parents on behalf of their child who attends our training. We also may have shortened the length of some of these testimonies. As the saying goes, a picture says a 1000 words. Now even though we have many many great testimonies from happy students and parents over the years, we think this kind gesture from one of our J4K students says it all about J4K and what we offer our students in terms of, coaching, friendship, commitment, opportunities and a sincere will to help! 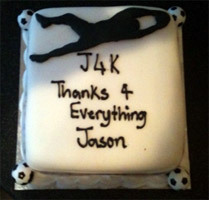 This cake was made for J4K coach Jason Pearcey, when one of his students had to leave. As mentioned above, I think this speaks volumes for what we do for our students! Ashley saved 2 out of 5 for the red team so they WON! I�m so proud of him i can�t put it into words. I just want to say thanks for setting up such a great coaching academy…….its brilliant. Here�s a picture of him with the trophy. We have been meaning to e-mail you for ages just to say what a great job you do at training, the whole set up, and the e-mails and videos !. The videos aren’t just full of helpful information they are CLASSICS and good round family viewing…….we love them. I would like to extend my gratitude to J4K for all the effort made by Mr Andrew Stevens to improve my daughter to the level she has achieved today even to the extent that Mr Andrew Stevens has attended�a tournament�to see�her progress. (I�will say no�more�as her stats speak volumes on her progress under J4K and the quality of Mr Stevens training). Andrew’s confidence has increased tremendously since joining J4K. He really believes in his own ability now. J4K is professional, very child friendly and so much good fun – the children don’t realise they are training! J4K goalkeeping is a well-organised academy. It is run by the special legend himself… Ray Newland and also his hard working Paula! All of the coaches are hilarious; they are not too serious not too relaxed making it a good experience. My son has improved immensely; it is great and much much fun for my child. We rate it 10/10, they are all hard working hero’s. My son has attended several professional academies and not one of them even come close to the standard of coaching that David receives from J4K! The training is intense but fun, demanding, yet relaxed and designed to bring out the best in the individual. The coaching system is light years of any academy training I have saw in my four years of watching my son. Re J4K: Nics confidence has grown + grown, when we watch him play his matches we see a goalkeeper worthy of being a professional on TV! This is all thanks to the J4K coaches. Their respectful fun coaching is SO good you cannot express how GREAT they make the keepers feel! Since my lad joined J4K, I’m amazed at his progress so far with all this expert coaching! His all round skills in goal now are at a level so high, the pride I feel when he’s applauded almost makes me cry! When he got his first man of man of the match, this was all thanks to you. The look on his face when he got this trophy… it was like his dream had come true. So three cheers from his trainer!!! By the far the best coaching I have come across!! Everything is SO positive and really boosts confidence and brings out the potential in all keepers. Mattie was low on confidence when he joined J4K, but J4K has completely transformed him and encouraged him, and more importantly he now really enjoys himself… so thanks to J4K. J4K is simply the best!!! I never knew working so hard could be so much fun! Since I stared J4K my goalkeeping has improved a lot. I would like to thank Ray and all the J4K coaches for their help, support and enjoyment. 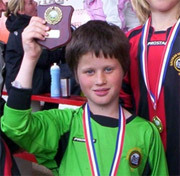 Aaron’s goalkeeping ability has brought him many accolades from many other foot balling managers. J4K has given him SO much confidence. Before my son attending J4K, nobody really noticed his goalkeeping abilities. However in the 12 short months he has been attending J4K, it seems every week we are having to turn away football league scouts to take my son for a trial. Michael is still only ten and I am very positive he is only going to improve over the next months and years to come – a big thank you to the J4K team of coaches. My son LOVES J4K, apart from the goalkeeping he learns, what I strongly believe is just on another level to anything that I have seen (including schools) is the life and self-confidence skills the coaches teach! Since George has attended J4K, not only has his schooling improved but the confidence he now has in himself is a total transformation on last year. With the whole of my heart, thank you J4K! Like most mums who have a daughter mad enough to play in goal, to get coaching for her was a total nightmare. At first we tried to get a woman coach but with the greatest respect, there just was not the quality or more importantly experience I was looking for! We tentatively decided to try J4K and too be honest Emma has not looked back! I strongly recommend any girl wanting to become a keeper to join J4K. With J4K being picked to represent woman’s football development for the Liverpool Capital of Culture this year, says it all about this great coaching organisation. Keep it up!